In English, the possessive adjectives are: my, your, his, her, our, and their. They indicate ownership. The Spanish possessive adjectives are listed in the table below. There are also the stressed possessive adjectives which go after the noun. ¿Te lavaste bien las manos? Me duelen los pies; voy a quitarme los zapatos. My feet hurt; I'm going to take off my shoes. 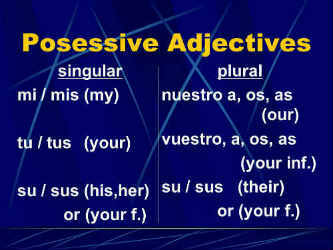 Possessive adjectives can be divided into two groups: the non-stressed and the stressed forms. Remember that su(s) is ambiguous; su casa = your [usted] house, his house, her house, its house, your [ustedes] house, their [male and/or female] house. A mi gato no le gustan tus perros. My cat doesn't like your dogs. Sus caballos arruinaron nuestras flores. Your [formal] / his / her / their horses ruined our flowers. Ésa es la casa mía. My house is larger than yours. La casa de él es roja, pero la de ella es blanca. His house is red, but hers is white. Beto: Es muy guapa su hija. Your daughter is very beautiful. El Padre: Claro. Es mi hija. Of course. She's my daughter. El Padre: ¡No! Tengo muchos hijos, ¡tengo ocho hijos! No! I have many children, I have eight children! Beto: Ocho hijos. Uno, dos, tres, cuatro, cinco, seis, siete... y Manuela, ocho! Eight children. One, two, three, four, five, six, seven… and Manuela, eight!